1. Wait for the Hama indicatorindicator to turn Redin color. Aggressive Entry: a. Wait for a MACD histogram bar to form below the MACD signal line. Conservative Entry: The MACD histogram must cross below (or be below) the “0” center line (- 0.00020 level). When you get confirmation from the two indicators below, place a Sell trade as soon as the signal candle closes (or at the open of the next candle). 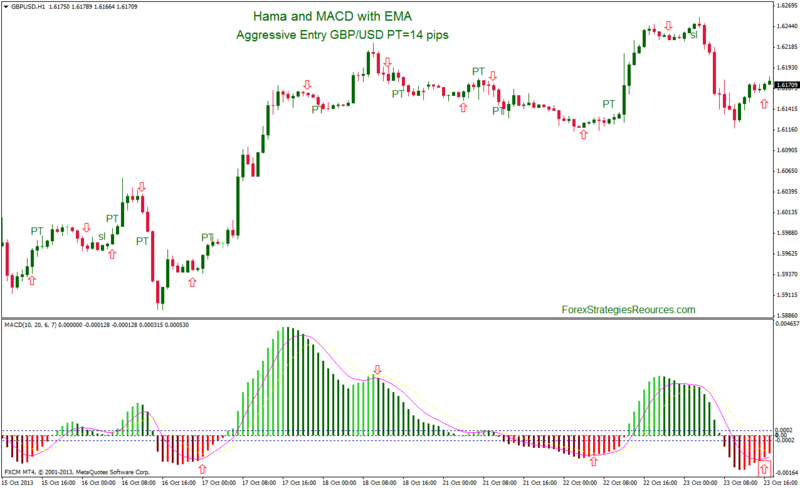 Set the Stop Loss a few pips below the most recent swing low or under the Forex Profit Boost indicator. Set the Take Profit Level at the same distance as the Stop Loss (1:1 risk-ratio). For example, if the Stop Loss is set at 30 pips then the Take Profit should be set at 30 pips. EUR/USD 12 pips, AUD/USD 11 pips, GBP/USD 14 pips, USD/CHF 10 pips, EUR/CHF 8 pips. The vantage of this Aggressive Entry (Scalping Entry ) is the higher profitability. The disavantage is the ratio Loss/Profit less. 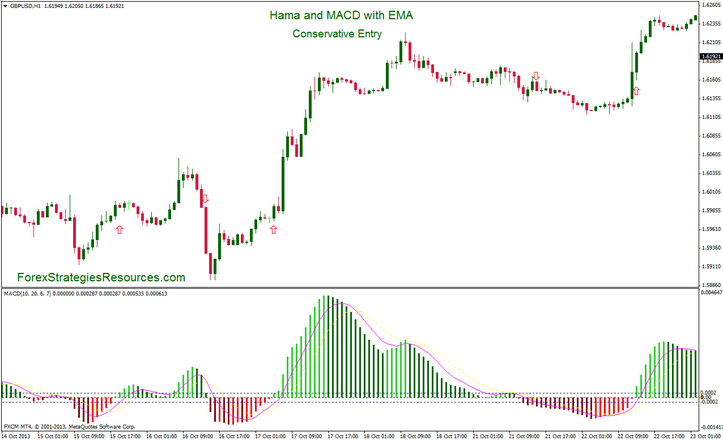 In the pictures below Hama and MACD with EMA in action.